Doctor’s orders: Read for enjoyment! I couldn’t resist snapping this photo of my friend Sara from Gracepoint Berkeley church, whose PhD. is in English Literature (so she’s the doctor — see what I did there? ), sitting in the Bibliopolis rocking chair, *fully* engrossed in and almost finished* with Gregor the Overlander (Book 1) whilst waiting for her son to finish his library time. You might have thought she only read from the English literary canon, but even people who study and analyze literature for a living can testify that a good story is what it’s all about! This picture is all the endorsement I need to go along with my claim of it being the best underrated fantasy series for middle grades. What Professor Hong reads when she’s not grading her college students’ essays! When she finally looked up from the book, she said, in that dignified cadence she has, “This book is so much fun!” And she had her son check out the book for her, and when she said excitedly, “You can read it too, and we can talk about it together!” his eyes got really big, really slowly, and he stood there, unblinking, speechless, with that slightly puzzled and uncomfortable frozen smile. If you know him, you can totally picture this, right? **Sorry, Jonathan, there aren’t any sparknotes on Gregor the Overlander. 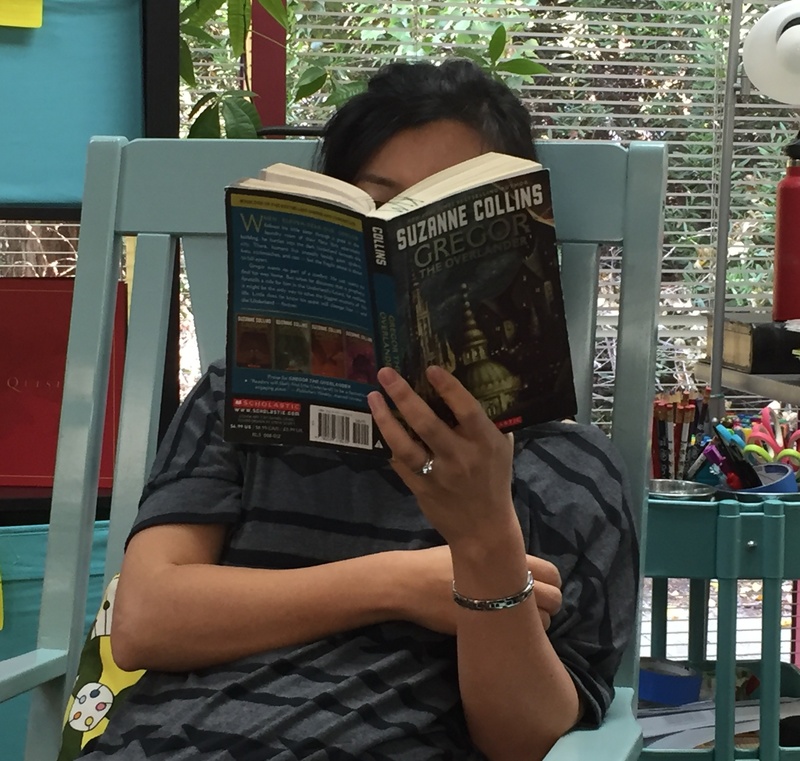 This entry was posted in Reading Snapshots, Recommended Reads and tagged english literary canon, gregor the overlander, literature, reading moments by hemilykim. Bookmark the permalink.